As an entry-level subcompact, the 2013 Chevrolet Sonic packs a lot of good stuff into a very small package. The Sonic's great gas mileage and affordable price tag are expected advantages, but many people will be surprised at just how comfortable the Sonic is on long drives. 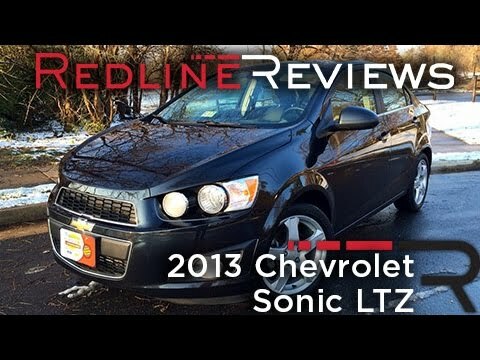 2013 Chevy sonic ltz: great economic car. Overall, my Chevy sonic has been very reliable. It receives good gas mileage, even in the city, but has enough power and stability to feel confident when merging or driving on the highway. The stereo system has plenty of power and clarity, and even allows you to select a locational concentration for the sound (i.e. Front right/left, center, rear, etc. ). My biggest complaints have to be that the turbo lag is pretty bad when trying to quickly accelerate, and the digital slip-resistant feature seems to kick in prematurely, and does not stay off upon cutting off the engine and starting. It's a very small and bare bones but overall cost effective car to own. My vehicle is decent. I have had it for a little over 5 years and it has not had any major problems. It is a zippy little car, and fun to drive. However it is pretty featureless and relatively uncomfortable. It has crank windows which is annoying at times. I would prefer it had usb or Bluetooth hook up for my iPod but just has an aux port, and I wish it had a backup camera. Also, my husband and I are large people and it is a bit too small for us. When I am ready to buy my next vehicle it will be a larger one with more features. 2013 Chevy sonic IT, gray. My car has amazing gas mileage. I save so much money on gas compared to my Jeep liberty (2007). I like the digital display and the radio is a really nice feature. It's really comfortable for three or four people. The trunk is a decent size for it being a small car. The only problem I have had so far seems to be with something dealing with the electrical system. I had to get a sensory replaced that was messing with my braking system and my trunk pops open sometimes even though I am not hitting the button to open it. General Motors (GM) is recalling certain model year 2013 and 2014 Chevrolet Sonic vehicles manufactured August 2, 2013, through August 12, 2013. Due to insufficient welds, the front fuel tank strap bracket may separate from the vehicle. If the front fuel tank strap bracket separates, the increased load may lead to the failure of the other tank support. As a result, the fuel tank may come loose from the vehicle causing a fuel leak. A fuel leak, in the presence of an ignition source, may result in a fire. GM will notify owners, and dealers will inspect the front fuel tank strap bracket, and repair it as necessary, free of charge. The recall will begin in early November 2013. Owners may contact GM at 1-800-521-7300. GM's recall campaign number is 13296. General Motors LLC (GM) is recalling certain model year 2013 Chevrolet Sonic vehicles manufactured from May 29, 2012, through August 29, 2012. When a turn signal lamp fails to operate, the Body Control Module (BCM) in these vehicles does not detect this condition and will not indicate the condition to the driver. Thus, These vehicles fail to conform to Federal Motor Vehicle Safety Standard No. 108, "Lamps, Reflective Devices, and Associated Equipment." If the driver is not aware that the turn signal is not functioning and does not have the light repaired, other drivers may not be alerted that the vehicle is turning, increasing the risk of a crash. GM will notify owners, and dealers will reprogram the BCM and the vehicle's key fobs, free of charge. The safety recall is expected to begin on October 3, 2012. Owners may contact the Chevrolet owner center at 1-866-694-6546.